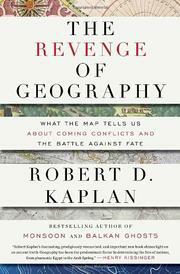 Jeremy Crampton has already trailed the launch of Robert D. Kaplan‘s new book, The Revenge of Geography: What the Map Tells us About Coming Conflicts and the Battle Against Fate (Random House, 2012) over at Open Geography. Kaplan has long been a correspondent for The Atlantic; from 2006 to 2008, he was the Class of 1960 Distinguished Visiting Professor in National Security at the United States Naval Academy at Annapolis, and since 2008 he has been a senior fellow at the Center for a New American Security. He is currently Chief Geopolitical Analyst for Stratfor, which claims that its analysts use ‘a unique, intel-based approach to study world affairs’, and yet where Revenge is praised for its revelation of ‘timeless truths and natural facts’ (for which you presumably don’t need ‘intel’). You can get a sense of Kaplan’s core argument in the new book from an essay published under the same lead title in Foreign Policy in May/June 2009 – though it doesn’t appear among the ‘Article Highlights’ on his website – which the Center for a New American Security called ‘eye-opening’. Really. Kaplan returned to the same theme in a ‘Saturday Essay’ in today’s Wall Street Journal called “Geography strikes back”: read it here (do scroll through the comments, but you may need a stiff drink as you do) and watch a WSJ video presentation here. If that isn’t enough, Robert Merry cheers Kaplan on in The National Interest here. If you want to know what Russia, China or Iran will do next, don’t read their newspapers or ask what our spies have dug up—consult a map. Geography can reveal as much about a government’s aims as its secret councils. More than ideology or domestic politics, what fundamentally defines a state is its place on the globe. Maps capture the key facts of history, culture and natural resources. With upheaval in the Middle East and a tumultuous political transition in China, look to geography to make sense of it all. Hard to know where to begin, really. For Kaplan location is absolute not relative – he is right to deride flat-earthers like Thomas Friedman, but immediately adds a qualification: ‘Technology has collapsed distance, but it has hardly negated geography’ – which is partly why his opening paragraph can represent maps as transparent windows into the world: ‘just the maps, ma’am.’ Forty years of critical cartography dismissed in a dizzying infatuation with The Map as Fact. The geography that Kaplan seeks to resurrect is obdurately physical: he instructs us that the Carpathian Mountains ‘still separate’ the Balkans from Central Europe (as though ‘the Balkans’ and ‘Central Europe’ are written on the surface of the earth, just there, not political and cultural constructions). Similarly, the friction of distance is, for him, a physical calibration whereas, as I’ve tried to argue in several recent posts, the tyranny that is exercised over distance is shot through with political, economic and cultural formations. A clutch of commentators have pointed out in what Foreign Policy called ‘the revenge of the geographers‘ that Kaplan’s geography is a perversely but proudly Victorian slash (the mot juste) Edwardian one, in which a combination of global geopolitics and environmentalism drives strategic state action (for another powerful critique, see Kyle Grayson at Chasing Dragons here and here and here). …we descend from Afghanistan’s high tableland to Pakistan’s steamy Indus River Valley. But the change of terrain is so gradual that, rather than being effectively separated by an international border, Afghanistan and Pakistan comprise the same Indo-Islamic world. From a geographical view, it seems naive to think that American diplomacy or military activity alone could divide these long-interconnected lands into two well-functioning states. At one in an ‘Indo-Islamic world’ (sic) that is the creature of a common bio-physical geography. Even so seemingly modern a crisis as Europe’s financial woes is an expression of timeless geography. It is no accident that the capital cities of today’s European Union (Brussels, Maastricht, Strasbourg, The Hague) helped to form the heart of Charlemagne’s ninth-century empire. With the end of the classical world of Greece and Rome, history moved north. There, in the rich soils of protected forest clearings and along a shattered coastline open to the Atlantic, medieval Europe developed the informal power relations of feudalism and learned to take advantage of technologies like movable type. Not surprisingly, Kaplan doesn’t suggest what the solution to the current crisis might be. An appeal to the Pope is obviously out, so unless those tectonic plates get a move on, it’s hard to see how there can be one. Perhaps that accounts for the ‘Fate’ in the sub-title. Kaplan’s website provides a couple of revealing pre-publication reviews. Henry Kissinger agrees with the central thesis: ‘Geography has been the predominant factor in determining the fate of nations, from pharaonic Egypt to the Arab Spring.’ As we academics instruct our students, ‘Discuss’. And the other, by Ian Bremmer, President of Eurasia Group, says that ‘Kaplan wields geography like a scalpel’. How very true. But mind the blood. This entry was posted in geopolitics, nature and tagged Robert Kaplan by Derek Gregory. Bookmark the permalink. Oh dear, it doesn’t get any better, does it? Or any less popular, as I wrote in a paper a few years back taking on the ‘Artificial states’ argument of some economists (http://unige.academia.edu/julietfall/Papers/344351/Artificial_States_On_the_Enduring_Geographical_Myth_of_Natural_Borders). Depressing that such ‘geography’ gets such wide coverage. Go, Derek, take them on! He doesn’t just confuse the map with the terrain, he uses ‘map’ and ‘terrain’ as synonyms! It’s achingly ill-conceived. Wydaje się, że mamy koeljny bestseller jeśli chodzi o książkę nt. geopolityki. Ciekawe, keidy będzie polskie tłumaczenie.